Do you need us to add more? 1) 1st of all, true congratulations for "Per Aspera...". Why didn't you self-release or have it published by another label instead of waiting 6 years? -Thank you for your opinion about Per Aspera Ad Astra. Well, I didn't want to give this stuff to accidental label for a quick release. I've just recorded this CD and that's all. If someone would like to release my music, it's good, we can talk, if not that is also OK. I just create music...I think everything has a right time to be done. Probably right now is a good time to release Per Aspera Ad Astra. -After a long time and wrong contract with Novum Vox Mortis, Azyren from Alles Stenar has written to me with his proposal of release it on CD. We have been in contact for a long time so I was sure he is a professional guy and I've decided to co-operate with him. Our co-operation has shaped up very well. 3) Are you gonna remain a one-man band forever? -No, I've never wanted to play music alone. I had a lot of troubles with some members. It's not so easy to find suitable people to create black metal, but I'm still trying...Up to now THIRST has been performing with 3 musicians. 4) Do you still recognize yourself in those songs or has your style changed meanwhile? -Of course we'll still be playing in THIRST's style but our music will keep on evolving and progressing. We'll be faithful to our style. 5) I think Marek did a great job. Does he also play in some bands or is he just a producer? 6) Many think that to make a good feeling Black Metal album you need a low-fi recording, but in my view you proved them wrong. What's your opinion about this long-time fought issue? -There is no recipe for a good black metal album. This is not a cake. I think all artists put feelings into their music. Sound is not so important here but the relations between the musician and the listener are. 7) What is the concept behind THIRST? -Aspiration to a spiritual perfection. 8) Do you think you'll record new stuff or re-release the old tapes on CD/vinyl? -We've just recorded a cover of BATHORY “Raise the Dead” for a tribute by Total Holocaust Rec. It is an honour for us to participate in this project. Soon we're going to record 4 new tracks for a split CD from Alles Stenar. 9) What's the debut response been so far? -The response is really good. I think today people are bored of this modern post black metal and are looking for good old school bands. 10) Have you ever played live? -Nothing I'd like to tell here. In the beginning we played a few concerts but it was for a short while. 11) What Polish bands would you recommend us? -I've never liked to mention bands. I think it is very individual for everyone. For me there are many good bands here but someone could have different opinions. 12) Do you have a website or is Alles Stenar going to have one? -THIRST doesn't have a web page. I think it is not important for us, but for what I know Alles Stenar is going to do their web page. Maybe in future I'll do a web page for THIRST. -I had some plans, but this project has never been born. For now one band is enough. 14) Time's up. You can add all you want for the readers. And of course thanks for your time and keep up the great work! -Thank you for an interview and support. Hail to you and Italian maniacs. See you in the age of Darkness and chaos!!! Contact THIRST only by Alles Stenar. 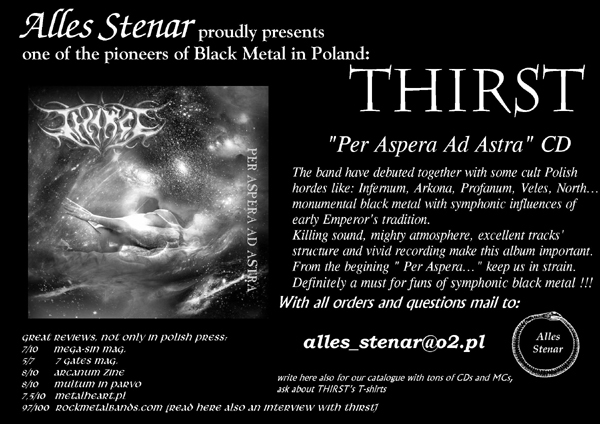 For CDs and T-shirts of "Per Aspera Ad Astra" and our catalogue with tons of CDs and MCs write to them too.